A brilliant video suite for Windows. Edit and cut videos to a professional standard, and apply special filters and effects. Update: The latest version of VSDC features a vastly improved user interface, with a smart new dark design and the ability to detach the timeline. This gives you a lot more flexibility with your free video editing software, particularly when working on multiple monitors. The software now also supports 360-degree video, and allows you to export clips at 120fps. There are look-up tables (LUTs) for pro-level color grading too, and automatic alignment when dragging objects. Original review continues below. VSDC Free Video Editor is a feature-packed non-linear video editing suite that can compete with even expensive editing software. There are no extra programs bundled in the installer – just the occasional prompt to upgrade to the premium edition. With VSDC you can create video projects from a combination of video clips, still images and audio files, with a resolution of up to 1,980 x 1,080 (full HD) and a maximum frame rate of 30fps. 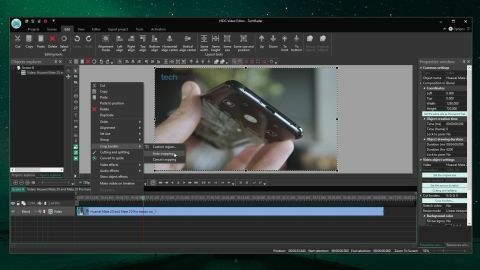 There's also a built-in screen capture tool for recording video and taking still images from your desktop – ideal for software reviews and tutorials. VSDC also offers an extensive range of video and audio filters, plus stylish transitions. You can export finished projects in a variety of formats, with handy ready-made profiles for popular devices. VSDC also provides a way to burn your project onto DVD – a feature rarely available in free editing software. Videos in VSDC Free are made up of 'objects', which include video clips, images, audio files, sprites, animations and many other elements. You can layer these in various ways, including blending, overlaying, and masking. If you're interested in picture-in-picture or watermarking effects, this is an incredibly simple way to do it. You can also add charts and text, which makes VSDC a brilliant tool for creating presentations with much more impact than a standard slideshow. Each object you add can be edited, moved and cut independently – nothing is final until you export your finished project. The audio and video effects are well worth exploring. They include various Instagram-style filters, as well as special effects like fire, smoke and water – all of which are fully customizable. If all that isn't enough, VSDC Free receives regular updates that add even more features. The latest version is significantly faster than previous iterations, and includes a stabilization tool that's ideal for footage shot with a shaky smartphone. It also enables you to upload multiple files to YouTube (if a project has been split into multiple parts, for example), and there's a new smart export profile for Instagram. The premium version of VSDC Video Editor is even faster thanks to integrated hardware acceleration, but this isn't available in the no-cost program and you won't be able to export your project if it's enabled. To disable hardware acceleration in the this version, select the cog icon in the top right, click 'Acceleration options' and uncheck the box marked ‘Use hardware acceleration for encoding video’. VSDC Free Video Editor is now available as a 64-bit version, offering much faster performance. There are new text outline settings, and various other additions and bug fixes. For full details, see the developer's release notes. Want to see what else is out there? Watch our top 5 competitors below!